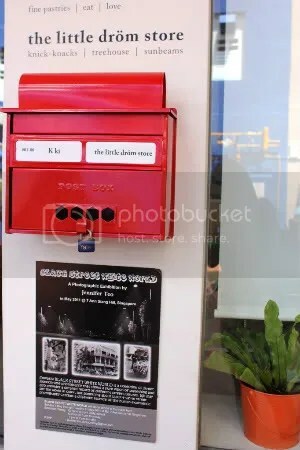 It’s great that the owners of k ki do not rest on their laurels but instead constantly strive to produce new cakes for their customers. The two newbies recently released are F.M, short for Fromage Melon, and Noisette. C and I arrived minutes before they opened. Boy was I glad to be early. For once, I saw the counter crowded with dainty little cakes. Even the elusive mont blanc made its appearance. But I wanted to introduce C my favourite k ki creation, the Kinabaru. The soft, silky coconut mousse with that tangy passionfruit layer is to-die-for. Don’t belittle the simplicity of the combination, if there’s any cake you should try in k ki, it has to be (without the slightest doubt) Kinabaru. 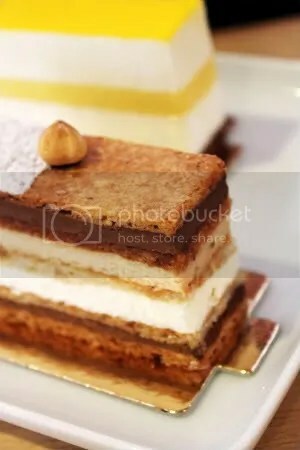 This is one of their newest creations, the Noisette. It looks really elegant with that hazelnut perched on top doesn’t it? 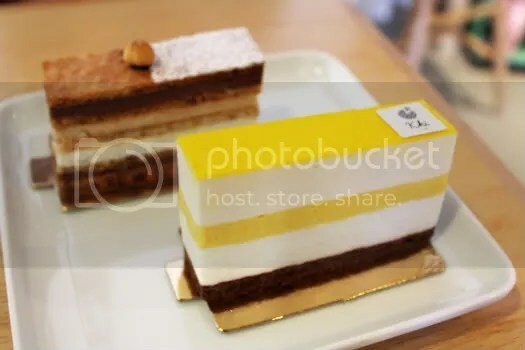 The sponge is unfortunately a little dry (same for kinabaru’s chocolate sponge actually) and it is quite apparent because there are three hazelnut cake layers to the ensemble. That said, the hazelnut mousse layer is so delicious. I like how the nuttiness is not overpowered by the bitter chocolate ganache. Best of all, it doesn’t make me think of fererro rocher (as much as I love that chocolate). The Litte Red Riding Hood (LRRH) is quite heavy, so don’t say I didn’t warn you. 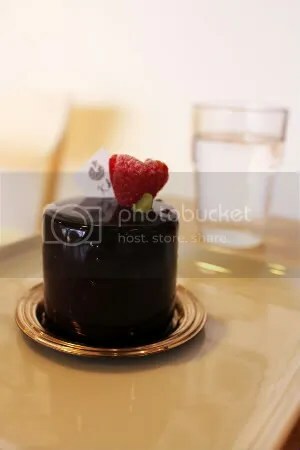 The pretty dark chocolate mirror glaze enrobes smooth milk chocolate mousse, a thin layer of raspberry preserve and a thin layer of sponge. It’s not something I would typically order- too rich for my liking. I suggest sharing this with someone alongside a lighter creation for contrast, like how we did. 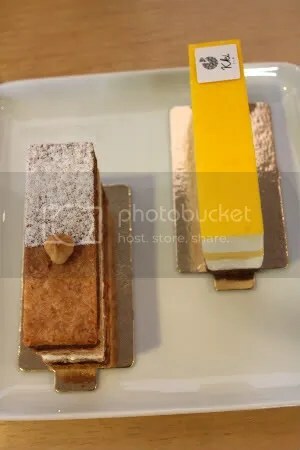 Though cakes here might be pricey for their petit portions (7-9 bucks thereabouts), it’s worth every cent because each creation is painstakingly made right down to the very last detail. I think kki’s strength is their mousse. So often we find mousse over-laden with gelatin. Kki differs from this norm, so make sure you try those creations which primarily consist of mousse (kinabaru!). Click to see my reviews of their strawberry tart, Antoinette, Emily and their sables.